Blood typing is a test that determines a person’s blood type. The test is essential if you need a blood transfusion or are planning to donate blood. Not all blood types are compatible, so it is important to know your blood group. Receiving blood that is incompatible with your blood type could trigger a dangerous immune response. Your blood type is determined by what kind of antigens your red blood cells have on the surface. Antigens are substances that help your body differentiate between its own cells and foreign, potentially dangerous ones. If your body thinks a cell is foreign, it will set out to destroy it. If blood enters your system with antigens that you don’t have, your body will create antibodies against it. However, some people can still safely receive blood that isn’t their blood type. So long as the blood they receive doesn’t have any antigens that mark it as foreign, their bodies won’t attack it. O: Type O individuals can donate blood to anyone (because their blood has no antigens), but can receive blood only from other type O individuals (because blood with any antigens is seen as foreign). A: Type A individuals can donate to other type A individuals and type AB individuals. Type A individuals can receive blood only from other type A individuals and type O individuals. B : Type B individuals can donate blood to other B individuals and AB individuals. Type B individuals can receive blood only from type B individuals and type O individuals. 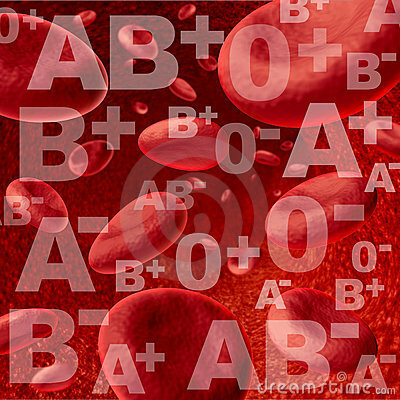 AB : Type AB individuals can give blood only to other AB individuals, but can receive blood of any type. Rh+ : People with Rh-positive blood have Rh antigens on the surface of their red blood cells. People with Rh+ blood can receive Rh+ or Rh- blood. Rh- : People with Rh-negative blood do not have Rh antigens. People with Rh- blood can receive only blood that is also Rh-. Together, the ABO and Rh grouping systems yield your complete blood type. There are eight possible types: O+, O-, A+, A-, B+, B-, AB+, and AB-. While type 0 negative has long been considered a universal donor, more recent research suggests that additional antibodies are sometimes present and may cause serious reactions during a transfusion. Austrian Karl Landsteiner discovered blood types in 1901. Before that, blood transfusions were risky and potentially lethal. Landsteiner made the process much safer, and he was awarded the Nobel Prize for his work. Blood typing is done prior to a blood transfusion or when classifying a person’s blood for donation. Blood typing is a fast and easy way to ensure that you receive the right kind of blood during surgery or after an injury. If you are given incompatible blood, it can lead to blood clumping, or agglutination, which can be fatal. Dr. Lekkos says the most important reason to know your blood type is to be prepared in case you’re ever in an emergency situation. “Most hospitals can get blood to you quickly, but if you have a rare blood type it can take hours or days to find the blood you need.” If you know you have a rare blood type, you can store it for future use. 5. Helps to prevent Complications which arise between mother and developing child. Blood typing is especially important for pregnant women. If the mother is Rh- and the father is Rh+, the mother and child will have different blood types. In these cases, the mother needs to receive a drug called RhoGAM. This drug will keep her body from attacking the baby’s blood cells if their blood becomes mixed, which often happens during pregnancy. 6. Your blood type may predict your susceptibility for certain diseases. 7. People of different blood types react differently to stress. Type A people naturally have higher levels of the stress hormone cortisol in their bodies and produce more in response to stressful situations. On the other hand, people with type O blood, have a ‘fight or flight’ reaction to stress which results in the overproduction of adrenaline. It takes type O’s longer to recover from stress because it is more difficult for them to clear the adrenaline from their bodies. No special preparation is needed for blood typing. If you think you might feel faint during the test, you may want to have someone else drive you home afterward. The blood draw can be performed at a hospital or a clinical laboratory. Your skin will be cleaned before the test with an antiseptic to help prevent infection. A nurse or technician will wrap a band around your arm to make your veins more visible. 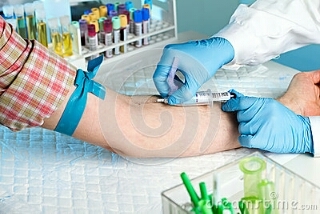 He or she will use a needle to draw several samples of blood from your arm or hand. After the draw, gauze and a bandage will be placed over the puncture site. In order to determine your blood type, a lab technician will mix your blood sample with antibodies that attack types A and B blood to see how it reacts. If your blood cells clump together when mixed with antibodies against type A blood, for example, you have type B blood. Your blood sample will then be mixed with an anti-Rh serum. If your blood cells clump together in response to the anti-Rh serum, it means that you have Rh+ blood. Your blood type can be determined in a matter of minutes. Once you know your blood type, you can donate blood and receive transfusions from donors in the compatible blood.